Battery capacity - claimed and real. Capacity - one of the most important criteria, which you need to navigate when buying. It is will determine how long your mobile device will remain offline until you get to the outlet. In order for the external battery to cope with its task, it is necessary to choose an apparatus whose capacity is at least twice the same indicator of the battery of the phone or tablet. 1. The battery capacity of a good smartphone is about 3000 mAh, which means that it requires an external battery for 6000 mAh to charge it. By the way, these are the characteristics of power banks, whose value for money is considered ideal. 2. If it is necessary to charge a more powerful device or several devices at the same time, it is better to choose a PB with a capacity of 10,000-12,000 mAh. 3. You can find a model designed to charge the laptop, but then its volume should be about 20,000 mAh, and the output voltage correspond to the standard 12-19 V (preferably with the possibility of switching). Alas, the passport data of external batteries rarely coincide with their real capabilities. About 80% of modern manufacturers offer banks with a capacity lower than the declared. And the difference is quite significant: in some models it reaches 25%, that is, instead of the promised 10,000 mAh, you can count only 7500-8000. For the sake of justice, we note that even bona fide manufacturers have discrepancies, but for quite an objective reason. Yes, the actual capacity of their batteries is fully consistent with the passport, but the trouble is that the power bank will not be able to give everything up to the rest. First, the batteries installed in it have their own self-discharge indicator - small, but still. Secondly, a controller is installed inside the RV box, which increases the output voltage, and some part of the energy is also spent on its operation. When choosing an external battery with the calculation for a certain amount of charge, do not forget to increase the required value by about 20% in order to have a sufficient capacity reserve. If you just need an "ambulance", which will allow you to hold on to an overly gluttonous smartphone until the end of the day, you do not need to chase large ampere hours - you may well have 1000-2000 mAh. This indicator indirectly affects the charging speed of phones or tablets. Themselves RV offer an output current in the range of 0.5-2 A. 1. For most smartphones, 1 A is enough. 2. In the case of tablets, this figure rises to 1.5-2 A. Of course, and they can be connected to single-ample batteries, but then the device is "tied" for a very long time. 3. If you have several different devices that require periodic charging, it makes sense to choose a good power bank from 10000 mAh with two ports: 1 and 2 amperes. In any case, try to ensure that the output current of the external battery is equal to or greater than the corresponding parameter on your mobile device. Which external battery should I choose? 1. If you often leave home for a long time, on the road you will need a power bank that can charge both the phone and your tablet at least 3-4 times. 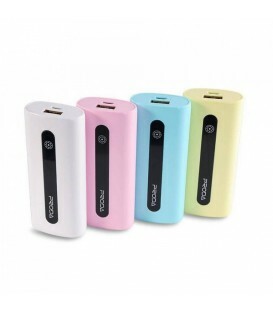 A device with a capacity of 10,000 mAh and a current capacity of 1-2 A is suitable. As for the number of ports, there is enough for one, since the probability of immediately planting both devices is too low. 2. 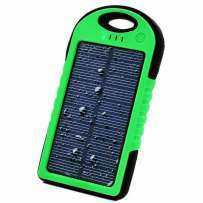 Those who generally leave "in the field" and can not take advantage of the benefits of civilization, will approach a power bank with the same characteristics, but with the option of alternative charging: using a solar battery, a dynamo handle or a cord for a cigarette lighter. 3. If your smartphone or tablet at work is not up to the evening, look for a compact external battery with a capacity of 1.5-2 times higher than the battery characteristics of the mobile device itself (usually 4000-6000 mAh). Additional functions are optional. 4. Going on vacation with the whole family or with friends, it is better to buy a powerful power bank from 12000 mAh with two output ports and an extensive set of adapters for different devices. 5. The same capacity is suitable for charging the tablets, but be sure to check that the output current is at least 2A. 6. If you often need to recharge a laptop with a non-removable battery, you will have to look for an external battery with a maximum capacity - within 20,000 mAh. Port - only 2-ampere, select the output voltage in accordance with the characteristics of the laptop.